This Panthénol based cream favours the skin restructuring. Furthermore, its specific formula has a comforting effect reducing itches and irritations. With its unique airless type packaging, the “Merveilleuse” permanent makeup cream is the ideal solution, hygienic, practical and so chic! The Shea tree butter has a remarkable effect on the moisturizing and protection of the epidermis. The Panthénol is a vitamin B component indispensable for our organism which enhances the healing and calms irritated and burning skins. Associated with TGO (oxidized corn oil) found as well in «Merveilleuse” permanent makeup cream, it offers excellent anti burning proprieties and calms the itches. 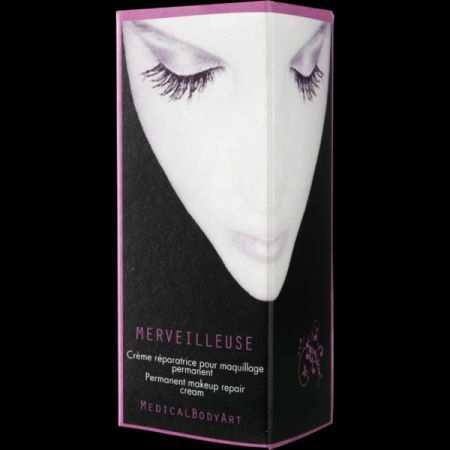 Apply the «Merveilleuse” permanent makeup cream onto the tattooed part by slightly massaging until complete penetration. Renew the application many times per day for at least 10 days. Do not let the tattooed part get dry, crusty. Keep it clean. Avoid dust, gardening, sun, swimming pools, hot tubs. Do not use makeup for 72 hours after being tattooed. Do not rub, peel or pick.